WinOff is an advertisement-supported program that has been developed by Softmaking srl. This company is also associated with the suspicious Search.golliver.com search engine. Our researchers have found that both of these programs travel bundled together, and you might install them with UltraZip and plenty of other suspicious programs. Even though we recommend deleting all of these programs, we have created this particular report to help you remove WinOff. You must have downloaded WinOff packaged with other programs, because it is impossible to download this browser extension from its official website winoff.net. The information on this site is represented in Italian, and this is not surprising, considering that Search.golliver.com is also specifically targeted at Italian users. 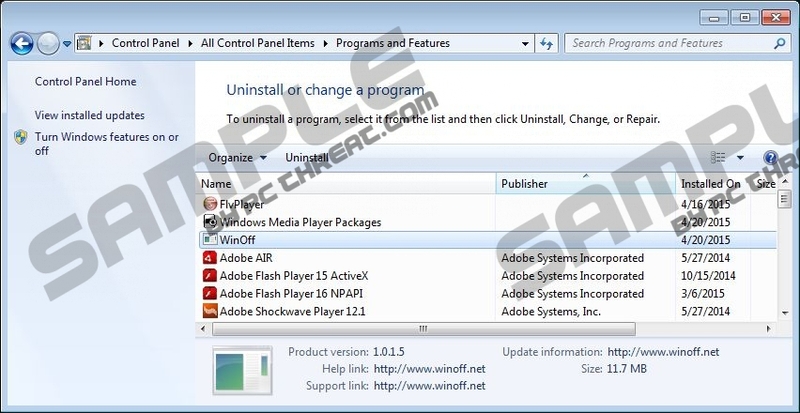 Of course, it is not good news that WinOff can be installed onto your PC by third-party installers, because they could install a bunch of unreliable programs that you will need to remove. If you are not sure if you need to delete WinOff-related malware, you should employ a trusted malware scanner. Needless to say, WinOff showcases pop-up and banner advertisements; otherwise, we would not urge you to remove it as an advertisement-supported program. It is likely that these advertisements will be displayed in Italian and will offer you seemingly beneficial shopping deals and discounts. Unfortunately, we cannot guarantee that all WinOff offers can be trusted. In the worst case scenario, the misleadingly attractive ads could be used to trick you into downloading other malicious programs, and you will have to remove them. Since WinOff is not a highly malicious threat, users often choose to delete it manually. It is most likely that all computer users will be able to delete WinOff manually without missing any leftover components. Unfortunately, we aren’t so sure about the third-party programs installed alongside this adware. If you are not experienced, it is possible that you will fail to remove WinOff-related infections from your PC, which is extremely dangerous to your virtual security. Even though you can remove WinOff manually via the Control Panel, we suggest removing the remaining infections using the automatic malware removal tool SpyHunter. This tool will scan your operating system, detect and delete malicious programs, and protect your operating system from attacks from other threats. You can rely on this tool to delete WinOff as well. Please post a comment below if you have any other questions regarding the removal of this adware and the related infections. Quick & tested solution for WinOff removal.